Where we live we really do have the best of both worlds. We are so lucky to be surrounded by beautiful Sussex countryside but we’re also just a short 15 minute drive from the coast too. It totally worked though so I’ll have to remember this one for future use. She went to bed like a good girl as promised and as soon as she got up Friday morning she started asking me if we could go to the beach with Daddy to get ‘chipppysss pleeeeease’ so there was no getting out of that one! The weather has been absolutely gorgeous all week here in Sussex and Friday was no exception so we managed to drag Josh away from his desk at work much earlier than usual and we headed to the coast to blow away the cobwebs. There really is nothing I love more than a spontaneous evening trip to the beach with my little family at the end of a busy week. There is something about the beach that I find so calming and I always leave wondering why I don’t visit more often. I left my phone in the car so that I had no distractions as I wanted to just soak in every moment with my two favourite people. It was the most beautiful evening at the beach and Bella was so excited to be there, she couldn’t wipe the smile off of her face. As soon as we got near to the water she was tugging her shoes off and demanding I did the same so we could splash around in the water. I’m pretty sure I spent most of the time with my heart in my throat as I watched my darling two year old fearlessly running through the water, with not a care in the world, looking like she was about to face plant into the sea at any moment 😉 It felt so good to feel the sand between my toes and the evening sun beating down onto my shoulders, there really was no where else I’d rather have been. 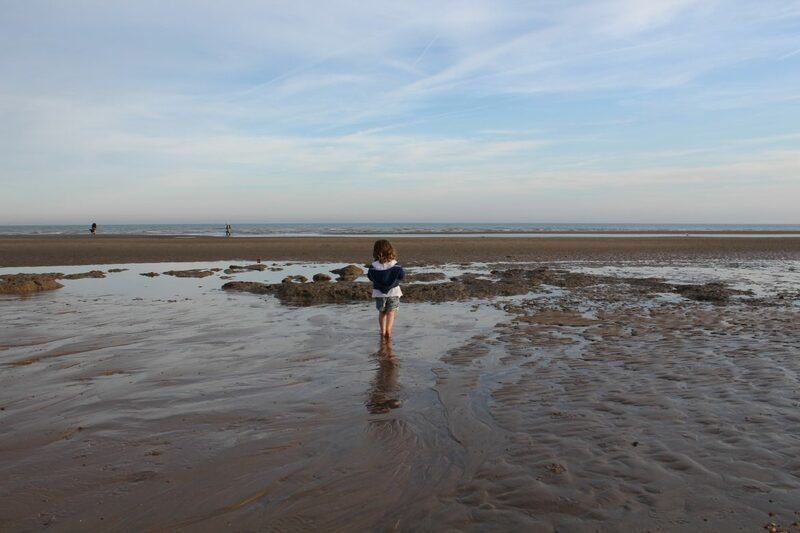 Spending Friday evening eating chips and walking along the beach splashing in the sea may not sound very exciting to some, but to my two year old, it made her whole frigging week! And seeing that look of pure happiness on her face as she chased the dog across the sand, well it made mine too. Children are so innocent and I love how they can find joy in the simplest of things. Something I need to practice more. Gosh, this kid teaches me life lessons every.single.day. This looks so lovely. We don’t live anywhere near a beach so I am looking forward to heading back home to Scotland next month and going to the beach near my in laws house or St Andrews where I went to Uni. My daughter has never been to the beach before so it will be a fab new experience for her.